if 808 played the thursday or friday, i would go, but can't do the saturday (mates wedding & i'm dj'ing it too), i managed to get the night off for easter sunday but can't do this one! Our chance to catch up your 808 live gig attendance then! yeh true, but u won't beat my uk appearances! Pete wrote: yeh true, but u won't beat my uk appearances! Doubt whether I'll ever beat your total appearances! 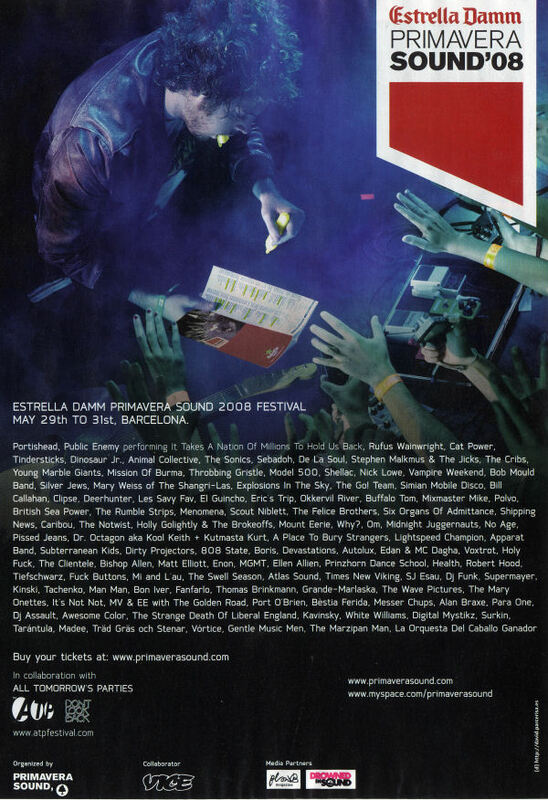 "Until february 21st we keep running the offer of three day tickets for Estrella Damm Primavera Sound 2008 at 95 € (subject to booking fee). From february 22nd tickets will cost 115 € (subject to booking fee)." Just had confirmation that 808 will be playing on the Saturday (31 May). From today there are two new selling points available where Estrella Damm Primavera Sound 2008 3-day ticket can be bought: Fnac France and Seetickets UK, you can access to these selling points through the "Tickets" section of our site. The 3-day ticket for the festival currently costs 115 € (subject to booking fee) until march 15th. Is anyone else going to Barcelona, except Nick K and myself? the man who sells globes, doesn't travel the globe?